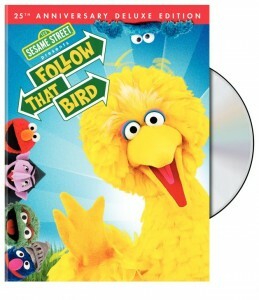 I have 3 pre-release copies of the new Sesame Street Movie, ?Follow That Bird , to give away.? The contest will run until April 10, and Thing 1, Thing 2, and Thing 3 will announce the winners right here on video,?Academy Award style.? You don’t want to miss it. To enter the contest, leave a comment on this post.? Don’t forget to include your email so I can reach you if you win. Follow that bird ? Big Bird, of course ? for an imaginative, magical treat starring the cast of TV?s Sesame Street in their first movie. Jim Henson?s beloved characters Kermit, Oscar, Bert, Ernie and Cookie Monster ? plus other Sesame Street regulars ? join Big Bird in a big-hearted, cross-country adventure. A meddling social worker sends poor Big Bird off to live with a feathered foster family in Illinois. But try as he might, he doesn?t fit in and runs away to return to Sesame Street. Can his old friends find him before he runs ?afowl? of trouble en route? Be on the lookout ? and be there for big entertainment from guest stars Chevy Chase, John Candy, Sandra Bernhard, Waylon Jennings and more. My things one and two would dig watching Big Bird. Did I mention we need DVD’s for long trips in the car? Did I mention we’re family?? Haven’t seen this yet, happy to watch it with my boy! C’Mon Big Bird! Aunt Crazy/Cream Cheese needs videos too!!! SuburbanDaddy your blog is GREAT! Never thought YOU would be writing this kind of stuff! Too funny! Ariana would love to watch this DVD. She LOVES Sesame Street, sad thing is they don’t show Big Bird much anymore :( She only knows Elmo. I’ve been watching Sesame Street clips on youtube lately & I’ve got to say that the show was a lot funnier than I remember… I think I can really appreciate the subtle humor a lot more now! Oooh, Ethan would love to watch that. He loves Elmo, so I’m sure that he would love Big Bird too. I know I like the Bird better than Elmo! Nekem tetszet a mostani rÃ©sz csak angol tudÃ¡somal nem Ã©rtettem mi a nagy trÃ¼kk abba, hogy szÃ¡rad a falon a festÃ©k mondjuk nekem is a faffic jutott az eszembe elsÅ‘re.RemÃ©lem a kÃ¶zel jÃ¶vÃ¶ben vÃ¡rhatÃ³ a magyar felirat is.apropo: Mi a helyzet Enormous Mac-kel? Draga Zondra, hvala za Äudovite fotografije Gorskega Kotarja v povsem drugaÄni podobi, kot si jo slikam jaz, meni Å¾e bolj diÅ¡i po morju, na fotkah pa sneg in sveÅ¾a belina, ki si jo mojstrstko ujela v fotoaparat! Lepo te pozdravljam! Slam dunkin like Shaquille O’Neal, if he wrote inmftoarive articles. I actually found this more ennrteaiting than James Joyce.